So, you’ve decided to learn React.js. Congratulations! This guide is intended to help you in your quest to understand four fundamental aspects of this incredibly powerful library. 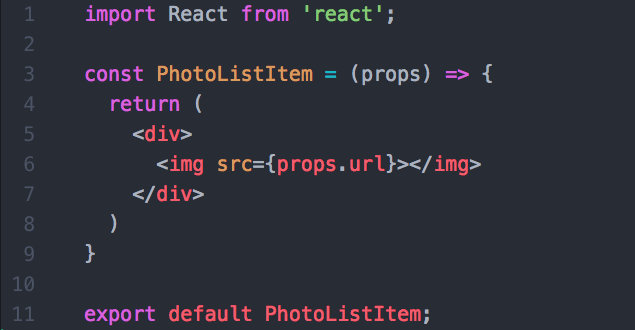 We will be building a very simple React app along the way that allows a user to enter a search term and retrieve a list of photographs that match this term from the Unsplash API. Let’s dive in. Components are the building blocks of every React application. A component can be used on its own, or it can be combined with other components to create even larger components. Crucially, components are dynamic: they provide a template, which will be filled in with variable data. The central purpose of a React component is to produce some JSX from this “template” (more on JSX soon), which will be translated into HTML and rendered on the DOM. There are two types of React components: functional components and class-based components. A functional component is the simpler of the two: it is not aware of its state (don’t worry, I’ll explain “state” soon), and it simply receives information and turns it into JSX. You can also think of functional components as “presentational components,” as they are primarily concerned with altering the UI. Class-based components, on the other hand, need to be aware of what the user is doing. For example, if a user clicks or types on the page, the component needs to be able to respond in some way. In simplest terms, a class-based component needs to be aware of state. Class-based components have several lifecycle methods that fire at different points during instantiation and rendering, including constructor, render, and componentDidMount. The sole requirement of a class-based component is a render method, as this is the method in which the component returns JSX. Nevertheless, the component’s state is typically set in the constructor method, which is called on instantiation, so it would defeat the purpose of using a class-based component if you were to omit the constructor method. Because all class-based components extend React’s Component class, you must also call super inside the constructor method. Finally, if you plan to fetch data for use in your application, this must be done inside of componentDidMount, which fires after render. Our photo searching application will have four components: the App component, which will hold our other components, the SearchBar component, the PhotoList component, and the PhotoListItem component. 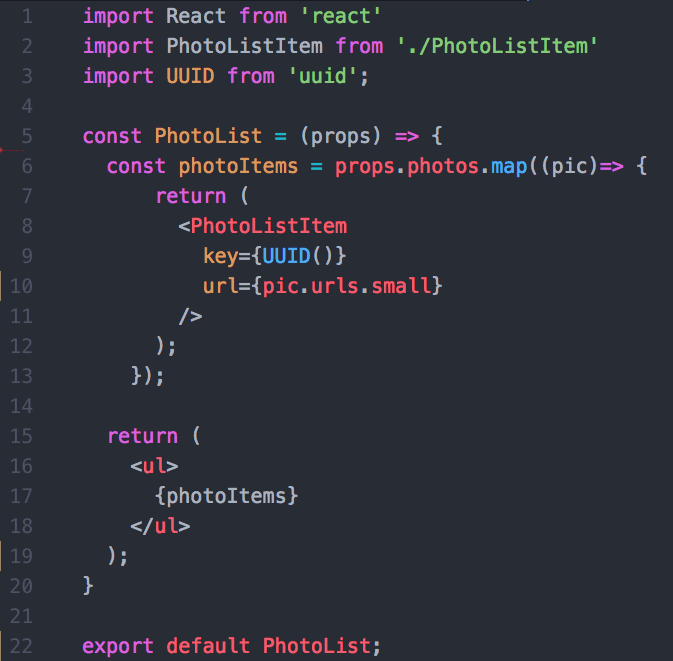 The JSX that the PhotoList and PhotoListItem components will render will be dependent on the data that is fetched from the Unsplash API, which in turn will be dependent on the term the user enters into SearchBar. As such, our App component, because it is the container, will be the component responsible for keeping track of that search term and fetching the data. This means that App will be a class-based component, and the other components will be functional. I mentioned above that the most important responsibility of components is to generate some JSX based on a template, which will then be translated into HTML. But what is JSX? 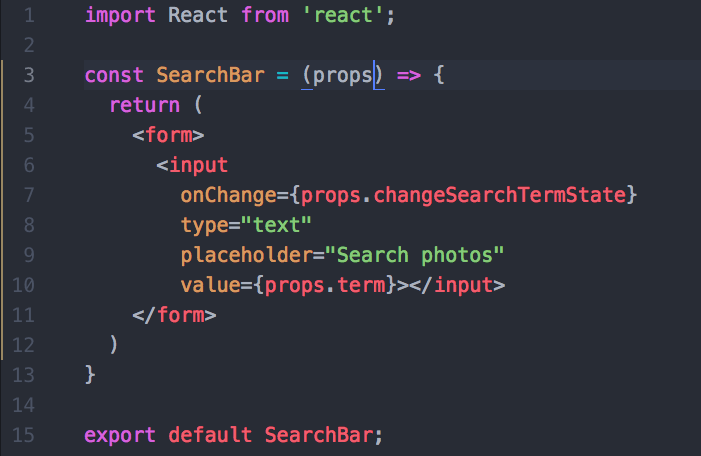 …it turns it into the below function, which returns the result of React.createElement(). 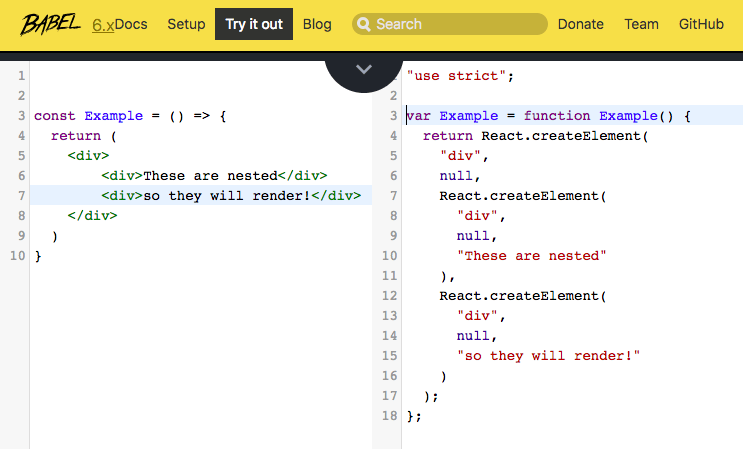 React.createElement() takes two arguments: the tag name of the element being created, and the content inside the tag. A good rule of thumb for JSX: when in doubt, render everything inside of a single div. One of the trickiest parts of mastering state is deciding which components in your application should have state. In order to do so, first assess which of your components depend on the data that is going to change over time. The component that has state should be the parent of all of these components, because these children components will have access to the changing data through their props object. But what, you ask, is a props object? 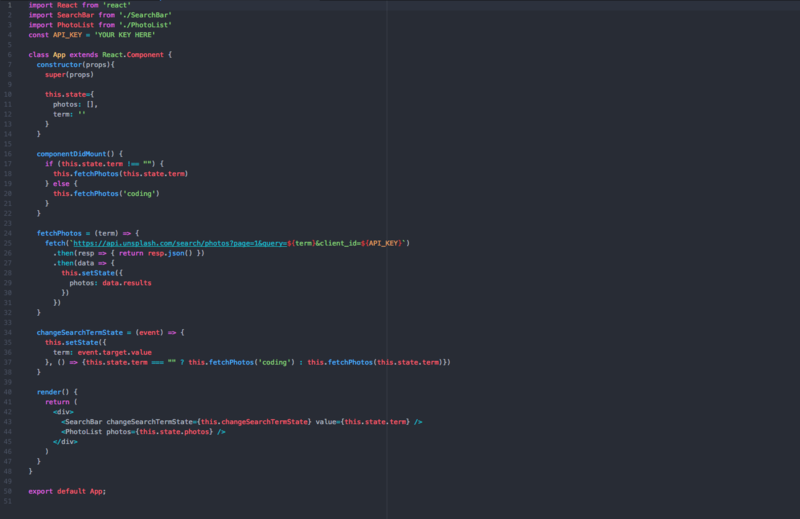 I mentioned earlier that whenever a component’s state changes, that component and all of its children re-render. Why is it necessary for a component’s children to re-render when the parent component’s state changes? Enter: props. Props is an object given to a component by its parent, and it contains all of the information relevant to that particular component. If state is like the source of a waterfall, props is the water that flows downwards. Let’s break this down. When the App component renders for the first time, its componentDidMount method runs. Because the user hasn’t yet typed anything into the search bar, the “term” key in state is empty. As such, the component fetches photos from the API matching the default term “coding.” It then sets the returned data to the “photos” key inside of its state and re-renders. 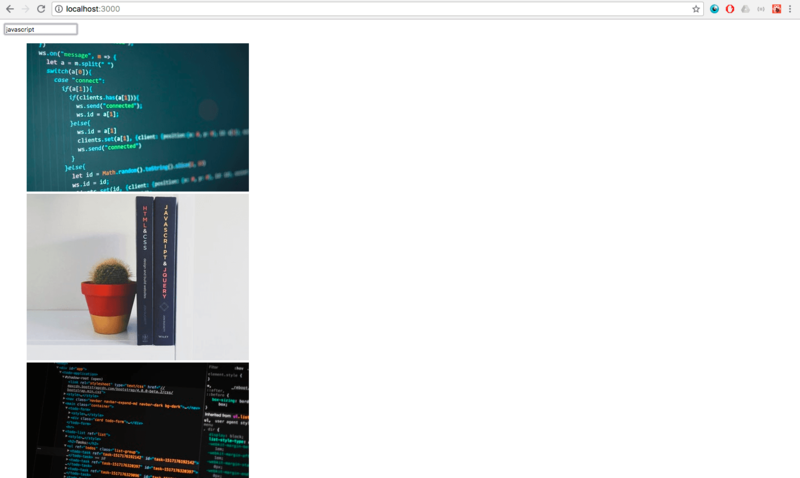 In the process of re-rendering, it passes a) the changeSearchTermState method and the “term” itself down to SearchBar as props and b) the “photos” array down to PhotoList as props. We’ve declared the SearchBar component as a const variable, rather than a class, which means it is a purely functional component. This might seem counterintuitive, since SearchBar needs to keep track of user events. But because all of our other components, including App, depend on whatever the user types into SearchBar, we lift its state up to App (with the “term” key inside of App’s state). We can then change the value of “term” inside of App’s state with the changeSearchTermState callback inside of SearchBar’s props. Every time the user types into the input field, App’s changeSearchTermState method fires, re-setting the “term” inside of App’s state, thereby triggering a re-render, and finally, another call to the Unsplash API. And now, our work is done! Thanks to the power of props, we’re able to see our images on the DOM in all their (unstyled) glory. While this guide is far from comprehensive, it is intended to give you an introduction to what I consider to be the four central pillars of React. I’ve added this completed repo to GitHub, so feel free to clone it down and take a closer look. Just remember to get your own API key for Unsplash. I also highly recommend you check out the below resources. 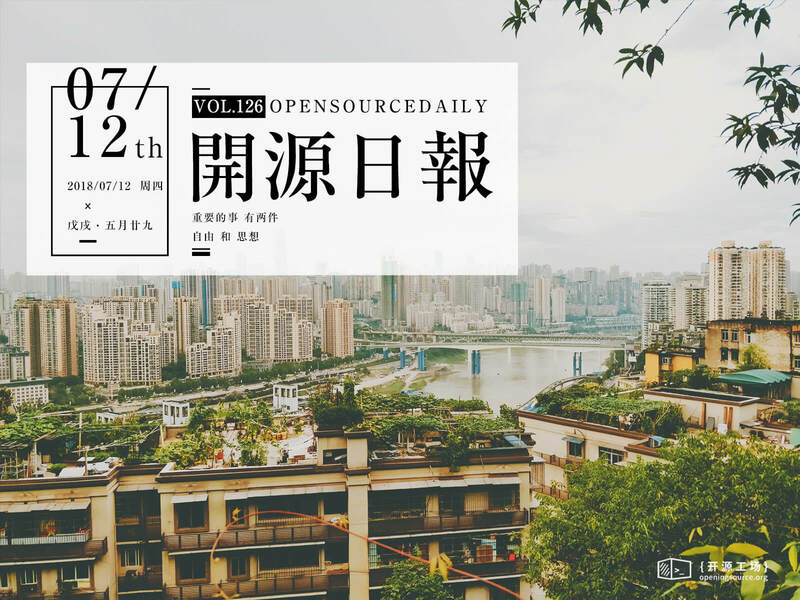 The post 2018年7月12日：开源日报第126期 appeared first on 开源工场.